A priest at a South Carolina Roman Catholic church says his parishioners shouldn't take Holy Communion if they voted for Barack Obama because of the Democrat's stance on abortion. 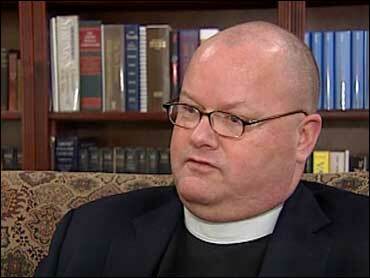 The Reverend Jay Scott Newman said Thursday that church law doesn't allow him to refuse parishioners the sacrament at St. Mary's Catholic Church in Greenville. But, reports CBS affiliate WSPA, Newman said his congregants shouldn't take communion until they do penance for supporting the man he called the most radical pro-abortion politician ever to serve in the United States Senate or to run for president. "We cannot leave our faith outside the voting booth," Newman told WSPA. "It was absolutely inconceivable that a Catholic could say, 'I could vote for this otherwise extraordinary man and hope that the consequence won't be a widening of the abortion license and an increase in the number of abortions,'" Newman said. Newman said that if a voter through his or her political action ("whether intended or not") contributed to the promotion of abortion, they need to "deal with it in the sacrament of penance." "Voting for a pro-abortion politician when a plausible pro-life alternative exits constitutes material cooperation with intrinsic evil, and those Catholics who do so place themselves outside of the full communion of Christ's Church and under the judgment of divine law. Persons in this condition should not receive Holy Communion until and unless they are reconciled to God in the Sacrament of Penance, lest they eat and drink their own condemnation. Penance, Newman noted, could include prayers, reading scripture or performing works of charity. Newman also wrote, however, that Obama - as the duly-elected next President - will hold legitimate authority over the nation, and so asked his congregants to pray for him, "and to cooperate with him whenever conscience does not bind us otherwise. "Let us hope and pray that the responsibilities of the presidency and the grace of God will awaken in the conscience of this extraordinarily gifted man an awareness that the unholy slaughter of children in this nation is the greatest threat to the peace and security of the United States and constitutes a clear and present danger to the common good," he wrote. "Religious citizens, even the ordained, do have a responsibility to join their voices to the public debate, so that the common good is well-served," Newman told WSPA. The priest went on to say he supports the separation between church and state. In their annual meeting earlier this week, the nation's Roman Catholic bishops vowed to forcefully confront the Obama administration over its support for abortion rights, vowing to fight what they called "aggressively pro-abortion policies, legislation and executive orders." "The recent election was principally decided out of concern for the economy, for the loss of jobs and homes and financial security for families, here and around the world," the bishops wrote. "If the election is misinterpreted ideologically as a referendum on abortion, the unity desired by President-elect Obama and all Americans at this moment of crisis will be impossible to achieve."